There’s nothing I love more than baking! It’s my stress- reliever and I just love the beautiful aroma of freshly baked goods! Mmmmmm… heavenly! I can bake well, but I needed a few more skills in the frosting department, and what better way to improve on them than YouTube! 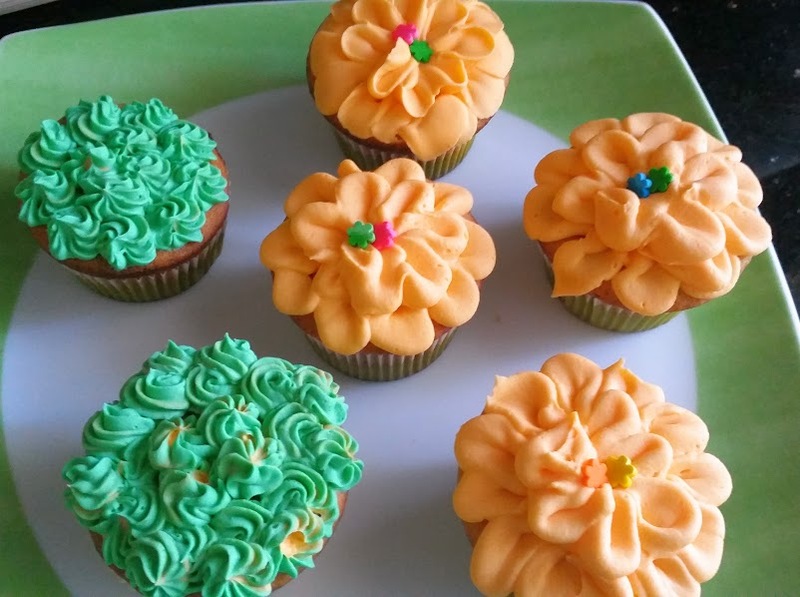 The site has several great videos and channels on baking, frosting and cake decor, and my post will include the links to those I utilized to make these ordinary vanilla and chocolate cupcakes extraordinary! I wanted to bake, just so I could experiment with frosting techniques!! Then again, one never needs an excuse for baking! I’ve tried several vanilla cupcake recipes, but the best and fluffiest thus far (and which I’m sticking to from henceforth) is by Jemma, who runs Crumbs and Doilies in the UK. I discovered her Cupcake Jemma YouTube channel, as part of Jamie Oliver’s FoodTube. Thanks Jemma! 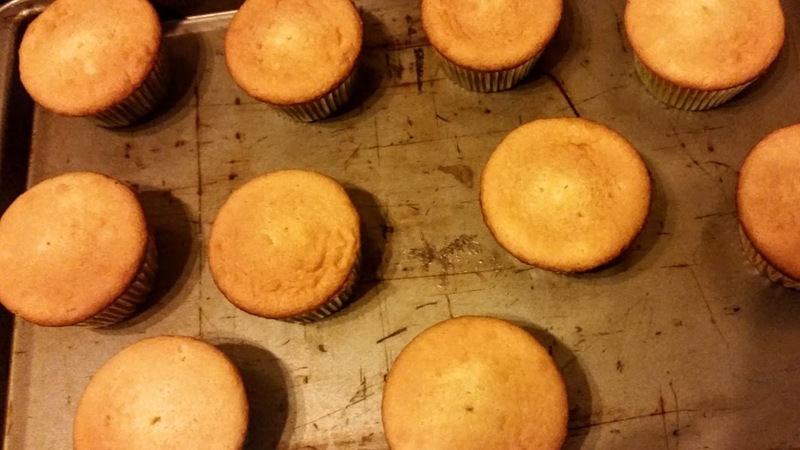 Preheat oven to 170 °C, and line a 12-cup muffin pan with paper liners. Sift the first 3 ingredients together in a large bowl. Add in the butter and the eggs and mix well. Start on a low speed and then increase, until the mixture is fully incorporated. Then, add in the milk and vanilla and mix well. Divide the mixture between the cups, filling each case to around 2/3 to a 3/4 full. Bake for 20-22 minutes, until the tops are golden brown and a skewer/ toothpick inserted into the middle comes out clean! I used simple butter cream frosting (adapted from “500 Cakes” by Susannah Blake). The recipe below make just about enough for 12 pretty cupcakes. Beat the butter, till it turns pale yellow and smooth. Then add in the rest of the ingredients and beat well. I tend to prefer using heavy cream over milk, and you can adjust the consistency, as per your requirements. Tint the frosting with your preferred colours (I chose pastel colours) and frost away. I followed this video for making buttercream begonia flowers (the orange-y frosted cupcakes in the title pic). The video calls for the use of a Wilton #125 Petal tip, but I had a #104, which worked just as fine. The steadier your hand while frosting, the petals are more delicate. It takes a couple of turns to practice, but it’s one of the easiest and prettiest ways to frost a cupcake. 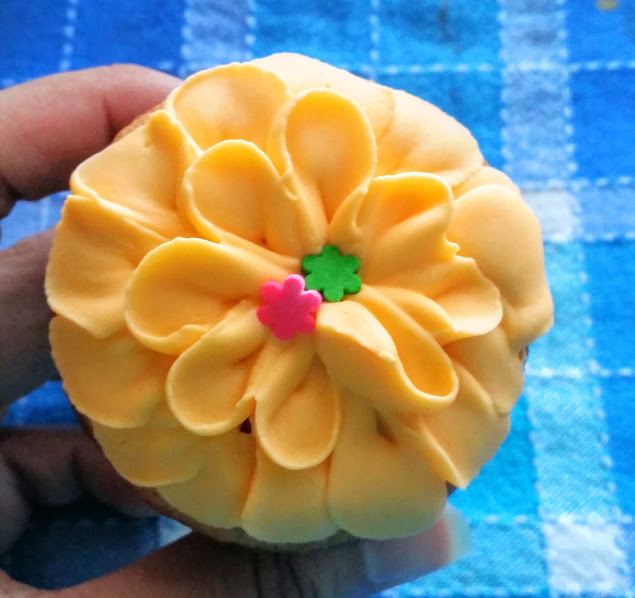 I used flower-shaped sprinkles to decorate the middle of the frosted flower, but you can use anything within your creativity! 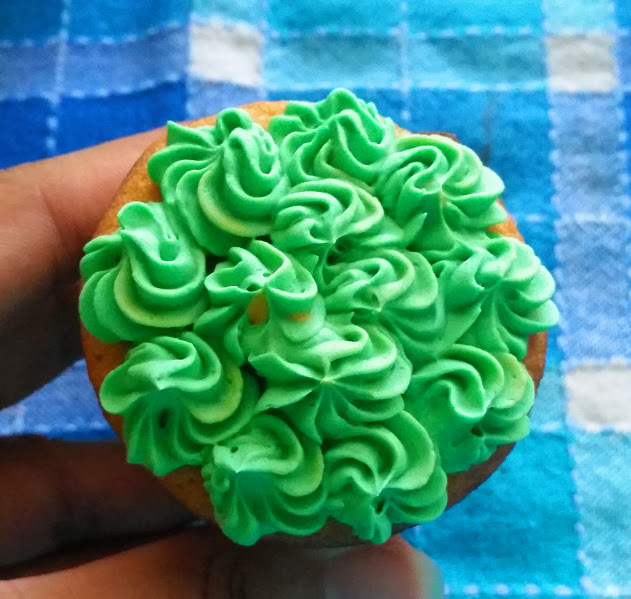 The cupcakes with green frosting were decorated using a Wilton #21, which makes small rosettes. The designs are endless and the only limit is your imagination! Here’s to my next post on Chocolate Cupcakes!